It is a course of applicants who wish to go to universities, graduate schools and vocational schools in Japan. 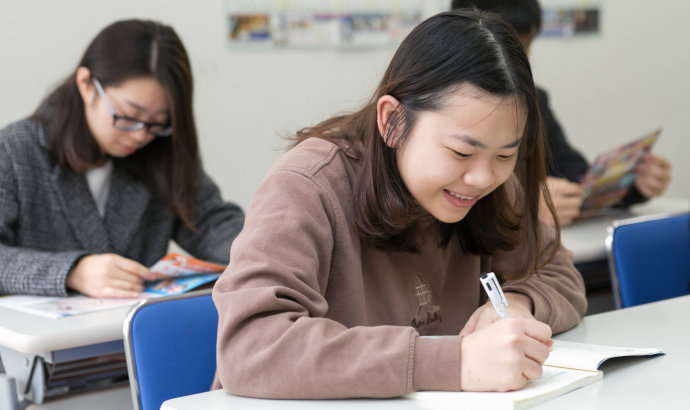 In this course, we will develop necessary Japanese language skills at Japanese universities, graduate schools and vocational schools. We will also conduct pre-college counseling and interview exercises individually. The entrance time is four times a year in January, April, July, October. The Lord will take measures against the “Japanese Language Study Abroad Examination” and “Japanese Language Proficiency Test.” In the classes, we will strive to improve the comprehensive Japanese ability of “Reading, Writing, Talking, Listening” in a well-balanced manner and also take measures to pass the Japan International Student Test / Japanese Language Proficiency Test (JLPT) with a high score, We aim to master Japanese ability to use in situations. We support the homeroom teacher and admission instructor so that they can go on to school suitable for each student. Also, from communication from practical Japanese that is useful for daily lives, from everyday topics, social topics to even more specialized fields of interest, you can learn Japanese comprehensively and have communication skills and expressions to deal with everything It cultivates power. A person who graduates from a senior high school and has more than 12 years of school years or equivalent qualifications. Those recognized as having the ability to pay tuition and living expenses while studying in Japan. It is healthy both mentally and physically and learns seriously by observing Japanese laws. The above amount is all tuition and various expenses (including consumption tax 8%) in the first year.